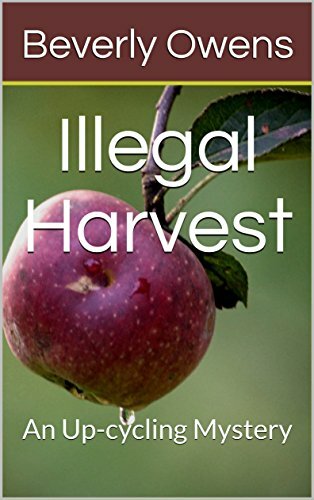 If you are planning a Halloween party this year and there will be adults attending, then you should think about the beverages that you will serve to the over 21 crowd. 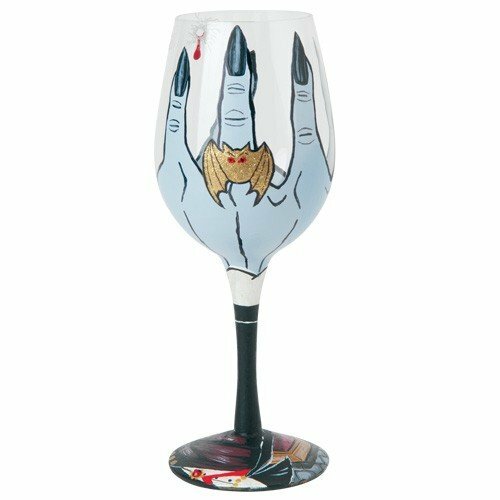 We talked a couple of weeks ago about some fun wine glasses for Halloween and today I want to show you some really fun ways to serve another adult beverage to add some additional decoration to your party. Depending on how many adults will be at the party, it just might be fun to have a few of these for them to use. Then again, they would be fun to just sit around as a part of the decorating for Halloween. 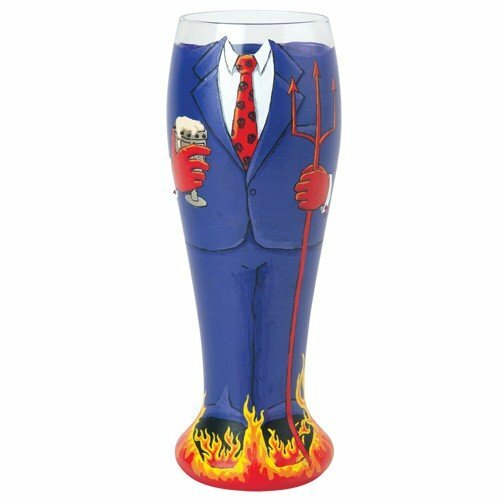 For those at the party who will be enjoying a light beer or a pale lager, a pilsner glass would be the best way to serve them their beer. Although these hand painted ones might not show the color of the beer like an unadorned pilsner would, they are just so darn cute that who cares whether they see the beer or not. It is a party after all and these glasses got dressed up for the event just like the humans did. 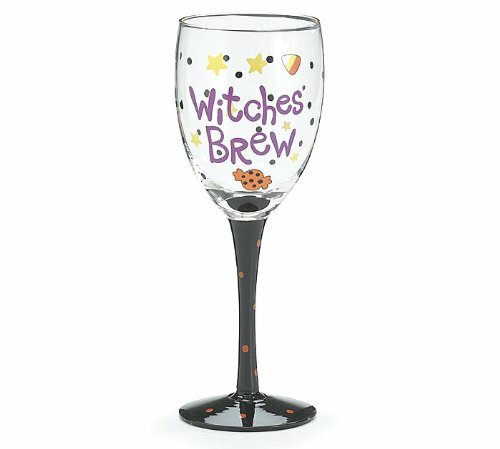 Oddly, I did not find much in the way mugs or steins that are decorated for Halloween so that may not be an option for your party. My suggestion is that if you happen to see one, you might start a small collection to have on hand each year when you have people over for a party. If nothing else they can be a part of your overall Halloween decorations. Of course the easiest thing to serve beer in on Halloween is those good old reliable plastic cups and you can get them in a Orange Party Pack. They are also available in black. It would be fun to have a mixture of both and just let the beer drinkers choose which color they want. 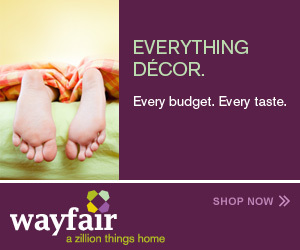 The nice thing about this choice is that they get tossed away and there isn’t any having to wash them or store them. They are not as cute as the hand-painted pilsner glasses above but certainly easier for clean-up duty. 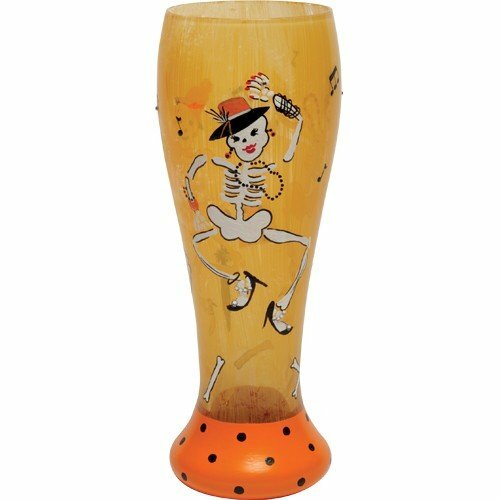 I love the hand painted pilsner glasses and want a few to add to my decorating. They are not ones that can be thrown in a dishwasher due to the painting on them so if you get them, you will want to wash them by hand so that the paint does not come off. Rather than actually use mine, I’ll have them sitting out where people can see them but I do not actually plan to serve any liquid in mine. I don’t know about you but in our home we usually have a bottle of wine opened at the bar at any given time. 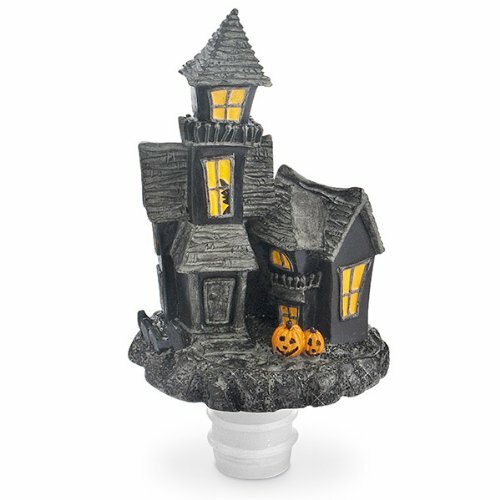 When it comes to decorating for holidays, I like to have one or two bottle stoppers that have a Halloween theme ready to top those bottles until we have finished it off. There are so many cute stoppers with this theme that you can add to your bar accessories and make them a part of your decorating each year. A few of my favorites that are available this year are shown here on this page. There are others available but these really caught my attention. They do not have to be on a bottle of wine, you can just as easily place them on other bottles like bourbon, gin or any standard bottle that needs to be topped after it has been opened. Typically we think of these stoppers to be used on wine because it is essential to use them on an open bottle before we place it in the refrigerator or on the bar top. They are convenient because we can not put the original cork back in the bottle and we do not want the extra oxygen to infiltrate our wine. 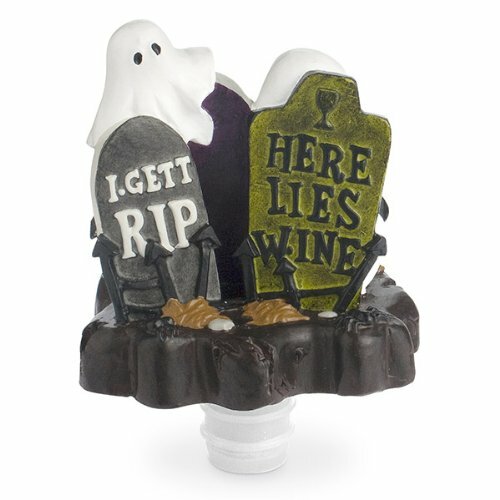 If we do not use a stopper (Halloween or otherwise) our wine will lose its flavor and become tasteless which is no fun. The most important thing is to make sure that the bottle is completely sealed by the stopper. 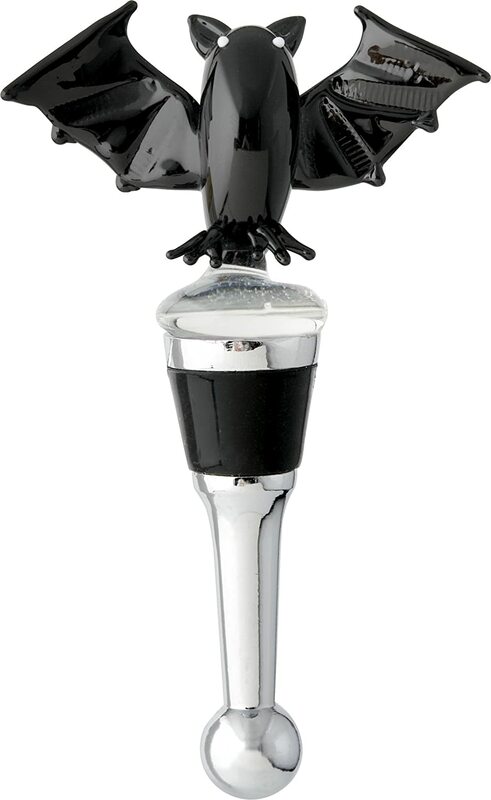 For additional selections of bottle stoppers for Halloween check out this link: October Bottle Stoppers. When Halloween is over just wrap these little toppers up and store with the rest of the decorations for next year. 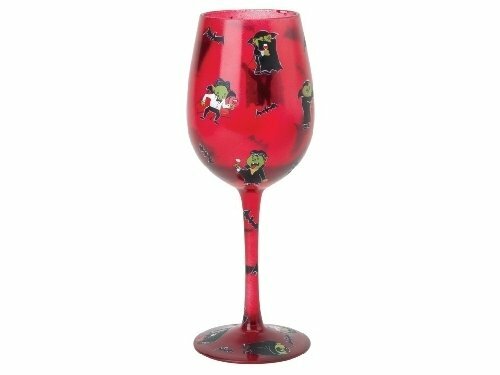 Whether you are planning an adult Halloween party or just want to have some special wine glasses for the month of October, have I got a surprise for you! 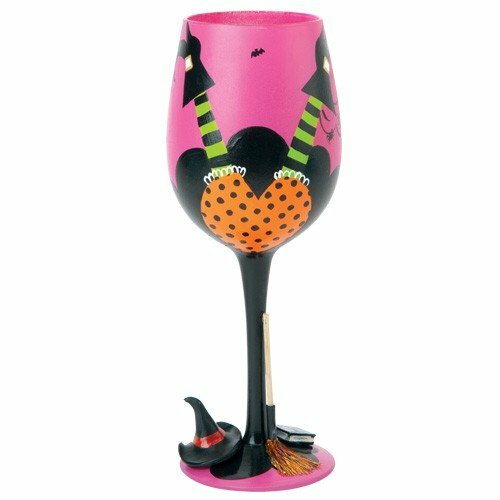 There are some wonderful glasses to serve wine in that have been decorated for Halloween. 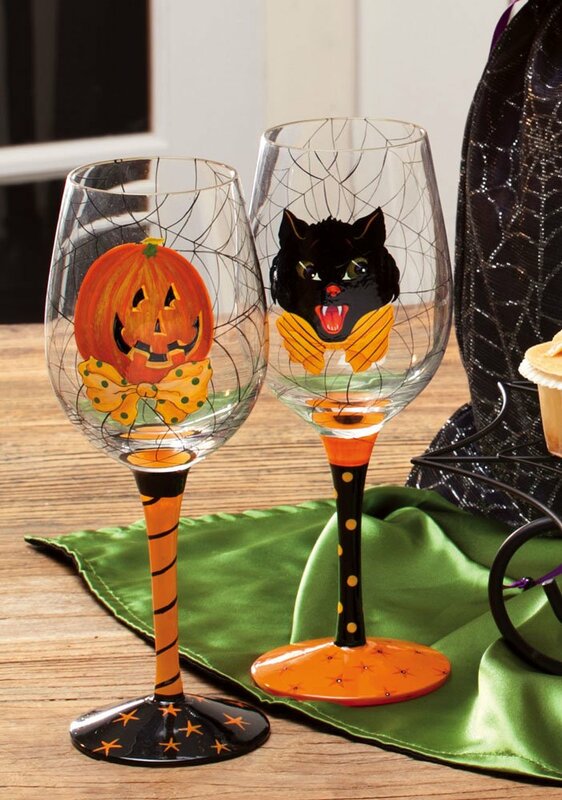 These glasses are just too darn much fun and can be a part of your decorations every year. Just wash them up at then end of the holiday and pack them away with the rest of the decorations to be pulled out and used each year. Here are some of my most favorite ones. 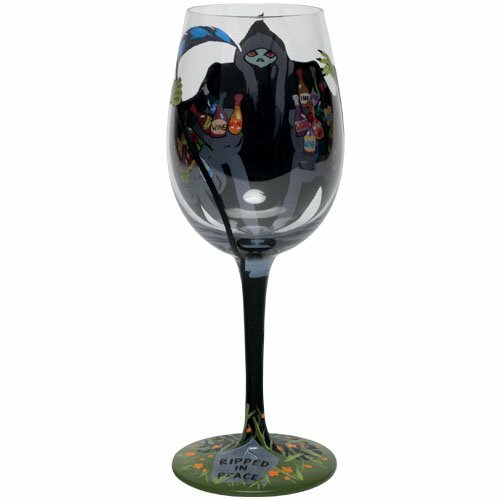 The selection above is only just a small smattering of what is available to have as a part of your bar ware for Halloween. Since wine was accidentally discovered in Mesopotamia around 6,000 years ago, we humans have enjoyed our vino more and more. It has become so popular in the United States that we Americans now buy more bottles of wine than even the French. 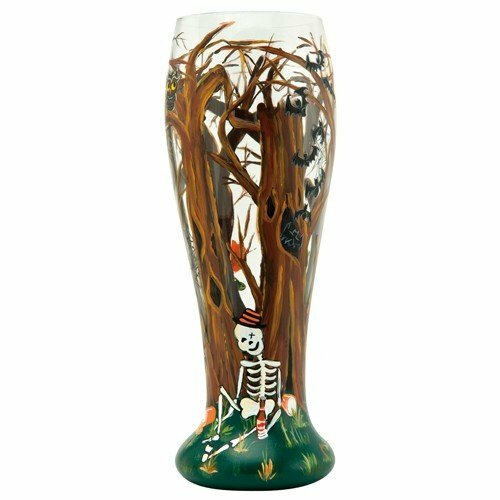 So, I’m thinking that if we are going to enjoy a glass in the evening or maybe two, we might as well make it even more enjoyable with a decorative glass that celebrates whatever season of the year we are in. Halloween should be no exception, at least in my opinion. These specialty glasses can be purchased one per year if you wanted to and then each year get another one. Shoot, it could be something to collect each year!